Some people might not consider Facebook a leading platform for games, but those people would be dead wrong. Hundreds of millions of people play Facebook games on a daily basis. 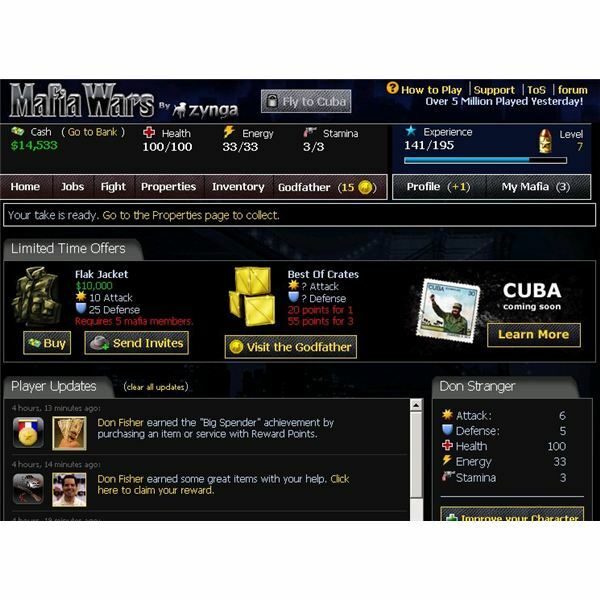 One of the more popular titles is the Facebook game Mafia Wars. It is similar to the version on the iPhone/MySpace, but it boasts a few new features and a lot more players. 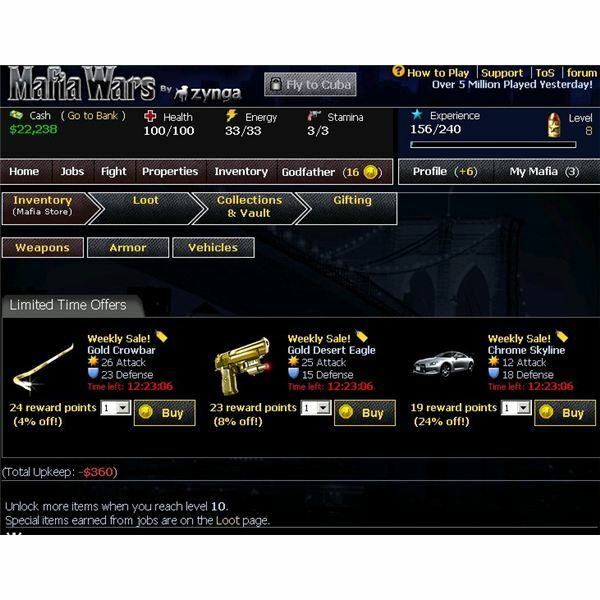 If you’re a Facebook user or an MMO fanatic looking for something new, it is definitely worth your time to give Mafia Wars a try. If you want to get off to a running start, this guide will provide the information necessary to do so. This guide will address the basics necessary to get your Mafia growing and thriving in no time. The game is fairly easy to play and getting started shouldn’t be too hard. However, there are quite a few options available for players to peruse and it might seem a little confusing at first. So to get things rolling, once you login to Facebook and pick a name after starting up Mafia Wars, it’s time to start earning cash. Mafia Wars actually sports some intuitive ways to get involved with the game early on without feeling like you’re going to lose everything. It’s unlike a lot of other games where you sometimes start off, buy an item or try to do a job and you end up penniless and dead. Hence, don’t fret over always trying to pick the right action or spend the dollar to the right amount to succeed in this game. You’ll notice that there are several tabs on the main screen that include: Home, Jobs, Fight, Properties, Inventory and GodFather. Now, when starting off there’s no reason to even bother with the GodFather tab; if you’re too curious to pass it up then by all means click on it. However, the GodFather tab is for purchasing reward points or claiming goods similar to Cash Shop items. Unless you’re a newbie who just needs to spend some cash for some quick reward points it’s not even necessary to bother with the GodFather. That’s not to mention that newbies can’t use a lot of the good items at the beginning of the game anyway. A good place to start off is with the Jobs tab. By clicking on the Jobs tab from the main screen you’ll be introduced to several available jobs designated by your level or rank. It’s best to do a few of the very first jobs in order to gain enough money to buy new items for higher paying jobs. Now, doing a job takes down energy and players are limited on how much they have at the beginning of the game. There is a way to slightly bypass the limited energy by completing the low-level jobs until you get a level-up in which case your energy will replenish. Now, like most other MMOs, this browser-based strategy game allows you to add stats to your character and improve your ability in any avenue you see fit for evolving. To add more stats and boost up your Mafia appeal, simply click on the Home tab. When the screen pops up you’ll be greeted with the stats of your character and the option to improve them. Now, considering that every player needs a good financial foundation to really kick-start an organized crime ring, the only way to do that is to do more jobs that offer more money, but at the expense of more energy. Now, you’ll notice that energy replenishes naturally every couple of minutes and the more energy you have the more of it will be refilled. So the best stat to increase at the beginning of the game is the Energy stat. Put as many stats into Energy as possible, this way you can perform more jobs and gain more experience. Other noticeable tabs include Fight, Property and Inventory. The Fight tab is more-so for experienced players and allows a player to do battle with other Mafia players. Again, when starting out this probably isn’t the best or wisest thing to do as it’ll only result in losses and wasted time. The Inventory tab is rather important because it deals specifically with purchasing new items that will help in leveling up your character and earning more money. The best thing to do is to avoid purchasing unnecessary items or weapons you won’t be using at the beginning of the game. 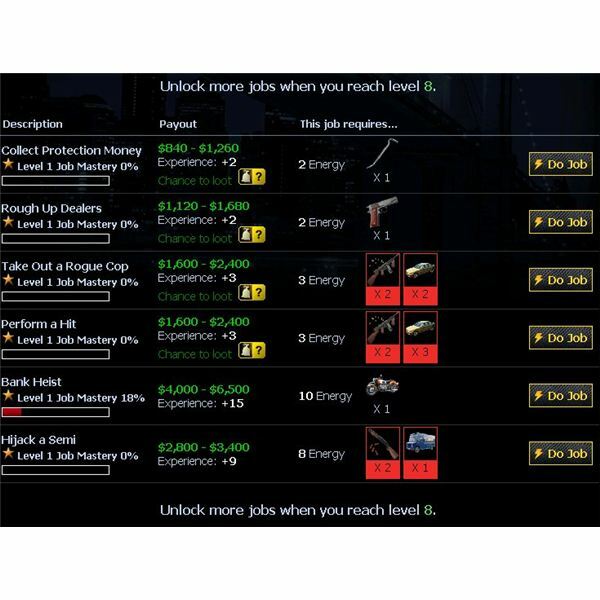 As you gain levels and earn more cash it’s important to scout through the jobs and the required items that will best benefit the growth of your character…this includes weapons, vehicles and miscellaneous items. Property is a very important tab and will take you to a screen that allows you to purchase, manage and attain funds from available properties. 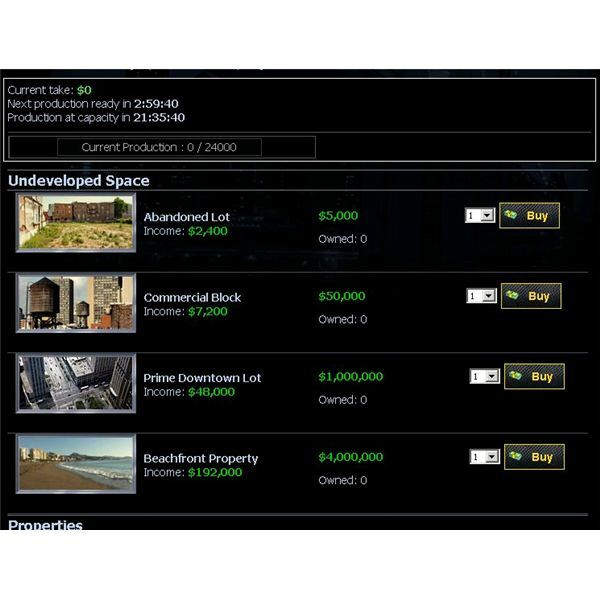 Much like other games that allow players to invest in businesses that return revenue streams, Mafia Wars allows you, the player, to purchase land, vacant property or even city blocks. Even though this seems like something that advanced players should mostly focus on using, it’s not a bad idea to set aside some money and purchase a vacant lot. After purchasing a lot you might want to buy a cheap business to put on the lot to maintain a steady stream of income when you’re not doing jobs. This also works well if you don’t have a lot of time to play but need a source of income to generate money while you’re offline or doing other things. 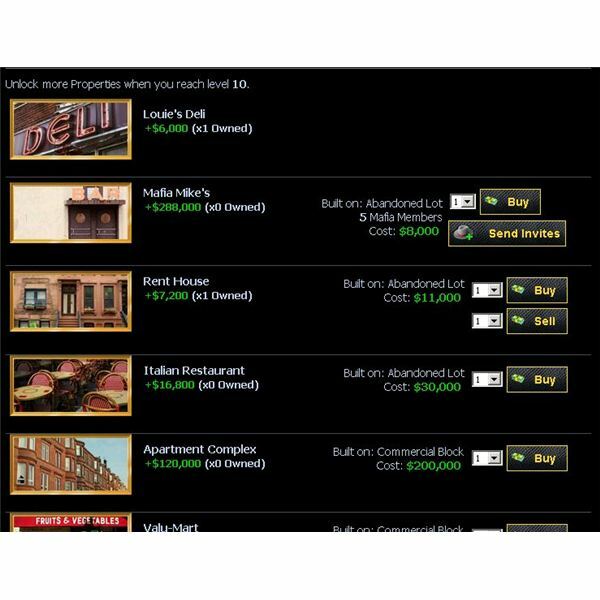 Another advantage to managing properties is that in some cases the more friends you have on Facebook using Mafia Wars, the more money you can generate from certain businesses. Hence, in this case the more people you know the more money you can potentially make. Now after reaching Level 5 the option to battle a boss becomes available. It’s not recommended to fight the boss right away until you’ve acquired enough Profile points to put into your defense and attack. Otherwise, if you decide to fight the boss without any stats on your attack or defense you’ll quickly find yourself on the losing end of the battle and potentially at risk of losing money. Instead, wait until you’re level 6 or 7 and have enough Profile points to attribute to your Defense and Attack before engaging in a boss fight. It’ll save you a lot of time, money and a trip down the loser’s hall of shame. Hopefully this covers most of the basics for getting started and finding a pace for playing the game. As you become more advanced and earn more cash as you play, you’ll find that the rhythm for making money and maintaining property is just like riding a bike. I hope this beginner guide to Mafia Wars helps you become a wealthy, feared and organized crime leader on Facebook.